The links and resources below have been checked for their relevance and for their sheer joy in the Teardrop family. Please click through to them and see the huge amount of information that is available to you. There is something for everybody here. Please email us your Teardrop or Vintage Trailer site at sales@teardropparts.com and we will include it here with the other supports of the camping and trailering community or if there is a link that you think we should have on our site. 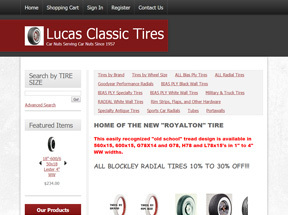 Lucas Classic Tires Lucas Classic Tires are the only tires used by Teardrop Fix-it Shop. Long-lasting, hgh-quality, reliable tires. 800-952-4333 Contact Russ. 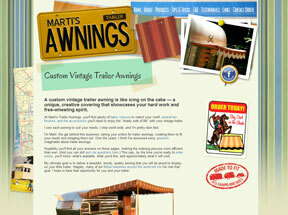 Marti's Trailer Awnings Marti's Trailer Awnings creates custom, vintage trailer awnings to compliment your unique style so you can enjoy "the shady side of life." Your Website Could Be Here Email sales@teardropparts.com to have us include your Teardrop or Vintage Trailer website here. There are more and more Teardrop web sites popping up all the time. We at The Teardrop Fix-It-Shop remain devoted to these icons of a simpler era. We hope these links will help you to do some cyber-exploring and that the information that you do find helps you. Email us (sales@teardropparts.com) your Teardrop or Vintage Trailer site and we will list it here with the other supporters of the camping and trailering community.